So, this upcoming week I get to move down one level. Bit by bit!!!!!!!! 13 Responses to The Great North Gable is…PAINTED! I can’t wait to see that second floor window painted!!! The beautiful one above the porch, of course! Oh Tony, I can hardly contain myself! When that section is painted, I will then re-install the fully restored stained-glass windows!!!!!!!! Then I am going to back-light them. So, at night, people driving by will get such a treat! That feature of your house is like a beautiful woman. The paint will be her dress and the windows are her jewels. I’m eager with anticipation. It looks wonderful! For my part, I’m looking forward to seeing the 1st floor porch painted. Because it’s such a beautiful part of the house. Actually, all the porches are fabulous. I am also dying to get to the north porch! I am counting the days till I get to remove the white vinyl storm door! I am counting the days till I get to refinish the oak door! 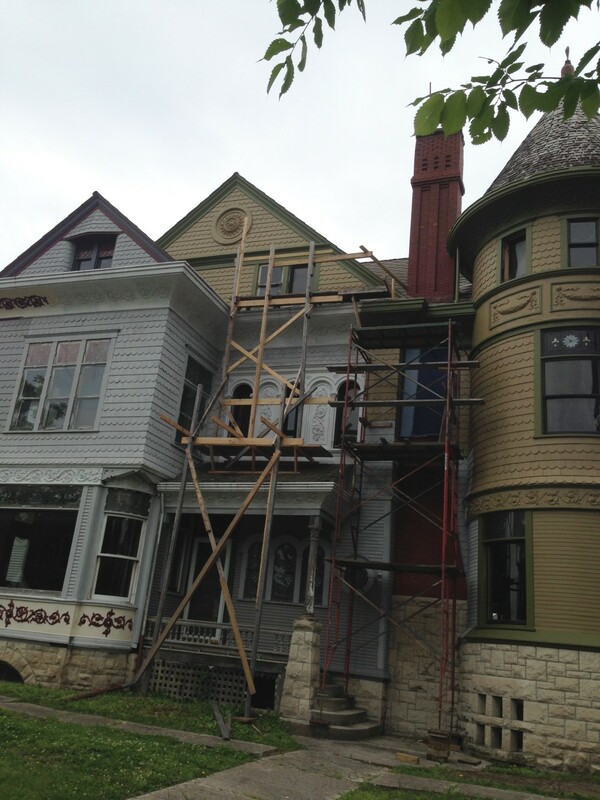 I am counting the days till I get to restore the ONLY extant 1894 porch railing! I am counting the days till I get to install the lattice which I had made in 2014! And I am now counting the days until I can drive by in the evening and see the stained glass windows lighted. Oh, gosh. I think you should have a lighting ceremony! Yummy. Traffic stopping gorgeous. You are not the only one getting a psychic boost from painting the exterior. Fixed roof and painted exterior and windows restored. Oh my!!!! Is the material of the “eye” and the ornamentation between the 2nd floor stained glass triptych windows pressed metal? Wonder why Squires didn’t use that for the panel under the front second story “floating” window? It’s usually the interior decoration that I get excited about, but this house has so many interesting exterior features that I can’t wait to see the finished product. Wouldn’t it be nice if all of us “commenters” could come help? I’d be glad to refinish that oak door.